Crowdfunding is simply a method of legally advertising a securities offering via the Internet or other means. The JOBS Act included provisions (Titles II, III and IV) that allow direct advertising of securities on the Internet by private issuers, without the issuer having to be registered as a broker-dealer or having to hire one to sell their securities. Capital markets in the U.S. have evolved over the past several years to take advantage of these rules. Historically, the terms “crowdfunding” and “crowdsourcing” have been used to describe a non-profit, rewards-based scenario, where persons were seeking donations or backers to fund artistic endeavors such as writing a book or producing a film in exchange for a token gift related to the project (for example, being listed in the film credits, tickets to a preview, or getting an advance copy of the book, etc.). Popular websites such as kickstarter.com, rockethub.com, kiva.com and indiegogo.com list these types of crowdsourcing offerings. Additionally, others use the term “crowdfunding” to describe any form of advertising for investors allowed under Rule 506(c), which allows advertising for verified accredited investors; or Regulation A+ offerings, which are public offerings with limited reporting requirements. Regulation Crowdfunding, also known as “Reg CF,” is another securities exemption that allows advertising for investors on the Internet for raises of up to $1 million in a 12-month period. However, there are additional regulatory requirements that make the costs of Reg CF somewhat onerous. These regulations include certain requirements such as drafting an offering disclosure document, contracting with a funding portal, complying with financial reporting and fulfilling filing requirements. Such requirements may make Reg CF one of the most costly means of fundraising yet. Additionally, a separate Reg CF offering must be used to raise money for one asset at a time. For example, the initial rules didn’t contemplate use of Reg CF for an ongoing fix-and-flip fund, hard-money loan fund or blind pool offering. Crowdfunding offers a means for issuers of Rule 506(c) or Regulation A+ securities offerings to reach a wider audience of potential investors with whom to build new relationships. This is good for investors, who now have access to a much broader base of private investment opportunities, and for issuers, who now have a means to legally advertise securities offerings to a wider audience of potential investors. 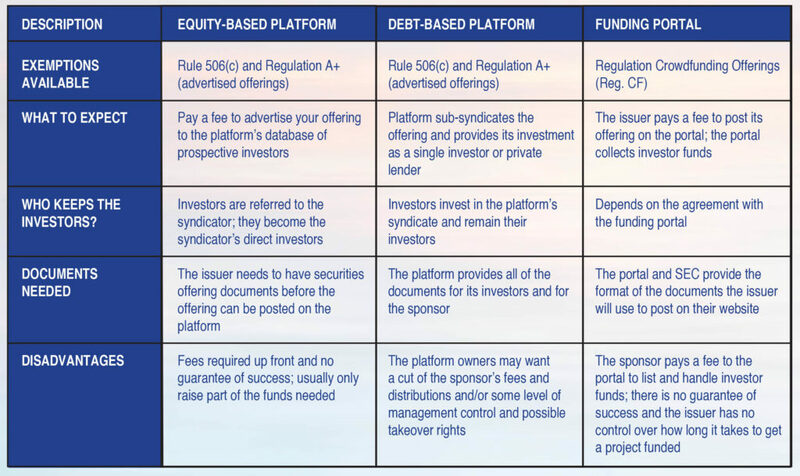 Issuers of Rule 506(c) and Regulation A+ offerings can offer and sell securities on their own websites, or they can pay a fee to a “crowdfunding platform” that will push their offerings out to the crowdfunding platform’s database of investors. Equity-based crowdfunding platforms and some debt-based platforms operate like a matching service. You will generally pay an upfront marketing fee to advertise your offering to the platform’s database of pre-qualified investors. There are no guarantees as to the amount of money a crowdfunding platform will raise, but they usually have a rigorous screening process and only projects that meet their narrow criteria and that their investors have an appetite for are considered. One crowdfunding platform representative told me they only accept about 4% of the deals that are presented to them. The crowdfunding platforms that have been around for a while have a track record and can make a pretty good estimate of how much they might raise for a particular offering before they ever post it. Another type of crowdfunding platform will sub-syndicate your offering, i.e., they will create their own securities offering and advertise, via their website, to their own group of investors, using a “fund of funds” structure. Their syndicate will either loan you money or invest as a single investor in your deal. Because they have developed pre-existing relationships with their own groups of investors, they may even invest in a Rule 506(b) offering. When you find accredited investors through a Rule 506(c) crowdfunding platform, you may be able to develop direct relationships with the referred investors and henceforth use them in future offerings. For crowdfunding companies that create a “fund of funds” to invest in an issuer’s offering, you will develop your own relationship with the principals of the crowdfunding company. However, it is unlikely that the crowdfunding company will be willing to share its investors’ contact information with you. Most crowdfunding platforms are seeking experienced syndicators. They will typically commit to raising a portion of the funds and expect you to raise the rest (although some may raise all of the needed funds). Crowdfunding platforms spend a lot of time generating relationships with private investors so that when they accept a new customer, they can “push” the offering out to their database of investors. At the time of this publication, most crowdfunding platforms would commit to raising $1 million to $3 million, although this amount is increasing over time as the crowdfunding platforms, the syndicators who use them, and the investors who become their “members” get more experienced with this type of investing. Some crowdfunding platforms use securities broker-dealers as a selling component; some use registered investment advisers; and other issuers strictly sell on their own securities. Further, several companies offer “white label” platforms where you can pay an upfront fee plus periodic maintenance fees to create your own crowdfunding platform that you can use to fund your own offerings from your own group of investors. Only time will tell which platforms, models and companies will survive, both from a practical and legal standpoint and there have been some failures since crowdfunding became legal in September 2013. But all in all, this is an exciting time for those brave enough to test the waters who have a solid track record and marketing plan in place. Kim Lisa Taylor is founding attorney of Syndication Attorneys, PLLC, a boutique corporate securities law firm that helps clients nationwide with their federal real estate securities offerings. She has been licensed in California since 2002 and in Florida since 2012. Her focus since 2008 has been securities transactional law. She and her team have drafted more than 300 securities offerings. The firm employs additional of-counsel attorneys and other support staff. The Syndication Attorneys, PLLC team assists entrepreneurs in structuring their investment opportunities to attract private investors, we draft the required legal documents, and we advise them on how to use securities laws to confidently raise the funds they need to achieve their business goals, either through their own network of family and friends or through crowdfunding on the Internet. Our team includes content creators, editors and designers who create marketing materials to help ensure your offerings make a memorable first and lasting impression. And we have relationships with a host of other service providers – including crowdfunding platforms, fund administrators, self-directed IRA companies, web designers, marketing specialists and others. We believe in educating our clients, frequently providing presentations and training for groups both large and small, experienced or just beginning, and even one-on-one VIP training.